It can be confusing choosing between an AWD and 4WD. The two terms appear similar. There was a time when most of the vehicles were front wheel drives but modern SUVs opened the market to 4WD. Cars have become more sophisticated and this has caused car users to find blurred lines between an AWD and 4WD. In this article, we are going to examine how the two transmissions operate. An AWD car supplies power to the entire car wheels. It is both front and rear wheel powered. In some cars, the manufacturers have the car running on front wheel drive and then it will power the rest of the wheels when there is a traction requirement. This later is called automatic AWD. With an AWD you have two drivetrains. A full time AWD has all the wheels powered at all times. Power to the car wheels is through multiple clutches, viscous couplings, and differentials. In an AWD, the driver does not need to engage the other wheels to operation. This is done automatically. Many car users choose to purchase a car with AWD due to the added traction control. The car handles well in snow and muddy areas since you have power being supplied to the front and rear axles. Full AWD cars enable you to experience the full power of the car. Some people may prefer getting a car with part time AWD. In this instance, power is supplied to the front or rear wheels and you can engage the other two depending on the terrain you are driving in. A four-wheel drive operates very similarly to the AWD. You have two drivetrains in the rear and front. In the AWD the driver has little control on the wheel operation. In the 4WD the driver can control traction and power through a series of car settings. If you want more traction you can choose a low setting while a high setting is ideal for snowy conditions. Just like the AWD, you have full or part-time 4WD. In a full time 4WD you have power constantly being supplied to all the car wheels. The driver, however, has better control on which tires receive more power. Part-time 4WD cars are either front or rear powered. When you need full-time 4WD you just press the button and power will be delivered to all the tires. The market for 4WD cars has changed from trucks to luxury cars. They are however more expensive than traditional 2 wheel drive cars. In a 4WD power is supplied equally to all the car’s wheels. This eliminates the need for vectoring. Power will be delivered from the engine then transferred to the wheels through the transmission. All the power is divided equally through all the wheels through a transfer case. With these settings, the car offers excellent maneuverability in off-road terrain. However, this is not a great car for a daily commute. The steering is tedious due to power being supplied to all wheels. 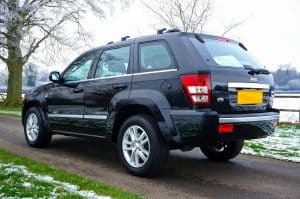 Which is better AWD or 4WD? As stated there is not much difference between the two. In fact, the names are used synonymously. AWD can be fitted in a variety of cars – especially sedans and SUVs. The cars are ideal for those who need some light off-road capabilities. If you are going to be using your car for city traffic you can go for the option that lets you change your settings to AWD. This is part-time AWD. If you are looking for an enhanced off-road experience then we would advise you to go with a car that is 4WD. This offers more off-road capabilities and the car often comes with high ground clearance. You can ride a 4WD car in snowy or slippery conditions. Most of the AWD in the market are part-time four-wheel drives. This makes them great for city traffic. You can engage the 4WD when going off-road. When it comes to most 4WD vehicles you will often the option of engaging 4 low or 4 high. When you engage all the wheels there is often some slip due to the high rates of speed. The 4 high settings compensate for the change in the rotational differential in the wheels. In the 4-high you can go at high speeds on slippery surfaces. When the 4WD drive car is set at 4 Low you can maneuver rocky surfaces at low range. In 4 low you cannot move very fast without damaging the car. 4WD offers more off-road capabilities that AWD. When a 4WD car has a part-time four-wheel drive you have intermittent locking and unlocking of the car’s differentials. When you lock one differential you are preventing the wheels from slipping on that side. You will find most trucks that have 4WD having a center locking differential. This enables the car to send power evenly between the front and rear axles. AWD is often associated with cars that are crossovers between an SUV and sedan. These cars have part-time AWD. During city travels the car operates as either a front or rear wheel drive car. When you are engaged in some off-road capabilities you can engage the AWD. 4WD drive cars have full off-road capabilities making them suitable for all terrain. You can adjust the wheels for 4 low and high. The drawback of a 4WD is that it adds unnecessary weight to the car and most of the cars are not fuel efficient. Your decision to choose a 4WD or AWD will depend on your primary terrain. In some cars, due to high horsepower, the car makers decided to make them AWD so that power is distributed equally amongst the wheels.